Possum control operations are making inroads into the most inhospitable bush and swamps in the challenging upper South Island area to protect cattle and deer herds from bovine tuberculosis (TB). Of the 68 herds infected with TB nationally, 44 are in the West Coast, Tasman, Marlborough and Canterbury north of the Rangitata River. Southland, Otago and Canterbury south of the Rangitata have 15 infected herds and nine remain in the North Island. They have been reduced from 1700 several decades ago as a result of work by TBfree New Zealand. . . Farmers with tree plots, and other foresters, could add a side business to their main income after research in high-value edible crops has come out with promising results. Plant & Food Research’s Alexis Guerin and Associate Professor Wang Yun have been investigating the delicacies of saffron milk cap mushrooms and bianchetto truffle on farm sites in Lincoln. The scientists believe there is room to commercialise the crops on forest blocks, although much research remains in its infancy. Truffles sell for about $3000 a kilogram, while the saffron milk cap mushroom usually sells for $30 to $50/kg and double that in upmarket European stores. . . The United States has toppled Germany as the go-to market for New Zealand chilled-venison exports. Deer farmers should be in good spirits, as venison prices are slightly ahead of last year’s and until lately exports to the US were sluggish as the global financial crisis continued to dent sales. Deer Industry New Zealand venison marketing services manager Innes Moffat said a strong economic recovery in the US had encouraged more chilled venison sales. “There has been a big increase in chilled venison cuts to the US in the last year compared to the year before. The US is now New Zealand’s largest market for chilled venison and over the last year it has overtaken Germany.” . . .
New Zealand can no longer wait for world dairy markets to wash over it and now is the time to be aggressive to create new profitability opportunities and focus on lifting productivity, the NZ Institute of Economic Research says. While dismaying to dairy farmers who had enjoyed record high global commodity prices, the steep fall in global dairy prices this year was a sign of world markets getting in balance, NZIER principal economist Shamubeel Eaqub said. “For a whole bunch of reasons all of a sudden the markets have gone from finely balanced in favour of dairy producers to very much out of favour. “We went through a really sweet spot, where the global production side was trying to catch up with a demand that somehow caught us by surprise. . . THE low adoption of Controlled Traffic Farming (CTF) practices throughout Australian broadacre farming areas has soil scientists baffled as to why more farmers haven’t tapped into its many advantages. By confining weight-bearing machinery wheels to permanent tracks across a paddock, CTF effectively limits soil compaction to about 15 per cent of the paddock and leaves the remaining soil to regenerate and lift crop yield potential. Despite the system being heralded as a breakthrough for farming nearly two decades ago, a recent survey of eastern Australian grain farmers found that only 13pc were using three-metre CTF, 21pc were using a combination of two-metre and three-metre CTF, and 66pc were using none at all. . . . THE adventures of our forebears often intrigues and that is certainly the case for Stuart Town woolgrower, Laurie Pope. Laurie has long been fascintated by the stories surrounding the journeys made by his grandfather, Michael John Pope, or Mick to family and friends, by bike while he was shearing in western NSW and Queensland during the late 1800s. The dust is well settled and much now covered by bitumen, but Laurie has always held the desire to retrace his grandfather’s bicycle tracks, so last February, accompanied by neighbour Cliff Hyde, he set out by vehicle to cover the 2077 kilometre round journey from the family property, “Weemala”, Stuart Town, to Eulo, Qld, but was interrupted by rain halfway through at Thurloo Downs Station, Wanaaring. . . The New Zealand Veterinary Association (NZVA) is encouraging farmers to consult their vet about suspected cases of Theileria on their farms, and how to best manage Theileria, as the latest data from the Ministry of Primary Industries shows an increase this season in the number of cattle infected with the disease. Naïve cattle that have been moved into affected areas are particularly at risk. Theileria, which causes anaemia in cows and is spread by ticks, affects cattle and is not a human or food safety issue. Signs of Theileria include lethargy, low appetite and reduced milk production. Dr Jenny Weston, President of the NZVA Society of Dairy Cattle Veterinarians, says that vets play a key role in working collaboratively with farmers to provide advice, taking both a preventive and proactive approach to minimise the disease. . . .
Economic activity strengthened in early 2014, according to the NZIER’s March 2014 quarter Quarterly Survey of Business Opinion (QSBO). Trading activity, which closely mirrors GDP growth, accelerated to the fastest pace since December 2003 – when annual GDP growth was near 4.5%. “While we do not expect economic growth to hit such heady rates in the current business cycle, as credit conditions are very different now, our latest survey paints a clear picture: the recovery is strengthening”, said Shamubeel Eaqub, Principal Economist at NZIER. Business confidence held steady in the March quarter, and remains at the highest level since mid-1994. Optimism and activity is being realised into hiring, investment, increasing margins and profits. Intentions to invest in building, in particular, are soaring and are at the highest level since records began in 1975. . . In 1975 New Zealand was highly regulated, protected and subsidised. Thanks to what the left still deride as the failed policies of the 80s and 90s businesses now stand or fall on their own merits rather than political patronage. Soaring confidence is based on the strong foundation of performance and not the shaky one of political whim as it was in those bad old days. New Zealand business confidence climbed to a 20-year high in the fourth quarter, lifting expectations for profits, hiring and investments, and raising the prospects for inflation to start to accelerate. A net 52 percent of businesses were optimistic in the December quarter, seasonally adjusted, the highest since June 1994 and up from 33 percent three months earlier, which was itself the highest in more than three years, according to the New Zealand Institute of Economic Research’s Quarterly Survey of Business Opinion. Domestic trading activity, which is closely aligned with economic growth, climbed to the strongest since March 2005, with a seasonally adjusted net 15 percent of firms experiencing a pickup in their own activity. Expectations for the coming quarter rose to 32 percent from 24 percent. “This quarter every region in our survey was doing better,” said Shamubeel Eaqub, principal economist at NZIER. 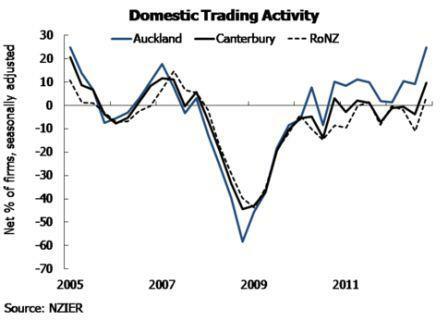 “Until recently much of the recovery was concentrated in Canterbury. This has now broadened to most regions across New Zealand, which points towards a more sustainable and stable recovery.” . . . Sustainable and stable are very reassuring words, much better than boom and bust which have been used, and experienced, too many times before. The top independent world economic brains in the OECD and IMF expect us to continue to outstrip most developed countries in the next couple of years. At last, we have the potential to make a serious move up that fabled OECD ladder. Net migration to Australia has also dropped sharply. At around 1000 a month, it’s about a quarter of what it was, and close to its lowest point over the past decade. There are risks – the world remains in economically uncharted waters. However, if we remain cautious and conservative in our approach, we should do better than most. And, of course, one or two good years do not change the fortunes of a country. We need many years of higher growth to provide better opportunities for Kiwis and their families. . . The dairy trade, particularly with China, and the Christchurch rebuild are contributing to the growing economy but they are only aprt of the story. What’s most encouraging is that a range of our companies across a number of industries are successfully selling their goods and services around the world, despite tough economic times. In industries like ICT, high-tech and medium high-tech manufacturing, engineering services, tourism, international education, wine and other food and beverages, New Zealand firms have got leaner and more savvy in the past few years and all that work is starting to pay off. The big thing driving the success of our entrepreneurs is their commitment to innovation; to developing products that allow them to demand a premium price in world markets. It’s that which determines their long-term success. . . . The government has helped by removing road blocks that discourage investment. A lot of work has been done and laws have been changed to ensure New Zealand is more welcoming of new investment while protecting against the risks. You need constant new investment to replace some of the old industries that become obsolete as a result of revolutionary technologies such as the internet. 1. Keep opening our markets and building strong people to people relationships. The lesson of the China FTA is obvious. If we can get a good TPP deal, then we should grab it – along with other FTA and trade opportunities. 2. Innovate, innovate and innovate. The National-led Government is putting a lot of taxpayers’ money into assisting firms and their ideas. As a country we are starting to see the power of innovation in our industries but we need to keep lifting private sector investment in research and development to international norms. 3. Keep building the skills of a successful and innovative trading nation. Encourage more of our young people into the careers that breed innovation, like engineering, ICT, and science. 4. Encourage more capital to invest in New Zealand. The mixed ownership programme has helped set up a stellar year for our stock exchange. We need to build on that. Capital investment in competitive industries creates sustainable jobs. 5. We need to keep removing red tape and provide certainty to investors, especially in resource industries. That means making decisions quickly and effectively, while also working to improve environmental outcomes. 6. We need to keep building infrastructure to support a growth-oriented country. Great progress has been made in electricity transmission and ultra-fast broadband. Those projects need to be finished. And we need to keep investing in our transport systems for safety and efficiency. That means high-quality four-lane roads in and out of our main centres, resilient highways elsewhere, and quality public transport that people want to use. Finally – and above all – we need to make responsible fiscal and economic decisions that keep the tax burden low and pay off debt. We need to keep rewarding New Zealanders with efficient public services and lower income taxes than elsewhere. It’s talented, hard-working Kiwis who get out of bed every day that make all this happen. Kiwis strive and succeed because they see the benefits of their hard work. If politicians keep remembering that then New Zealand will truly become a Pacific Tiger. That of course requires a National-led government. Any alternatives are focussed on taxing and spending, on redistributing rather than growing, and appealing to envy rather than aspiration. Economic activity in the December quarter surged to the best level since mid-2007 according to the New Zealand Institute of Economic Research’s Quarterly Survey of Business Opinion. Businesses are more optimistic (+19% from -1%, seasonally adjusted). The trading activity indicator for the December quarter also surged to the best level since mid-2007 (+8% from -4%, seasonally adjusted). This suggests annual GDP growth for 2012 will be above 2%. “There are encouraging signs of a strengthening economic recovery. The latest bounce is concentrated in Auckland, and Canterbury to a lesser extent,” said Shamubeel Eaqub, Principal Economist at NZIER. The latest pickup is not yet flowing through to the labour market. New hiring remains subdued and labour is getting a little easier to find outside of Canterbury. This is surprising as a recovery in activity tends to be accompanied by more jobs and increasing competition for labour that raises wages. This part of the recovery remains absent. It may be explained by reduced working hours during the recession, which are now returning to more normal levels, rather than through increased hiring. Investment intentions, while positive, are also low compared to what we normally see in a recovery phase. Capacity pressures are intense in Canterbury, but there is little pressure in the rest of the country. Firms do not intend to raise prices much. Consumer price inflation will remain low. Margins remain under pressure, but profits are beginning to lift on the back of better sales volumes. The RBNZ will keep interest rates on hold for some time. The QSBO shows the beginnings of a recovery, but still very low inflation. One quarter does not a full recovery make but it is a long awaited sign of improvement. The Christchurch rebuild is having a positive impact further afield than Canterbury. Building tradespeople I’ve spoken to in Oamaru in the last week say they were busy at the end of the year and busier still this year. The New Zealand dollar hit a post-float high of 82.62 US cents yesterday. That makes exports traded in US currency more expensive but it also makes imports cheaper and the NZIER says it will help keep inflation down. Inflationary pressures are building because businesses have seen their margins slimmed down and will want to recoup some ground when the economy picks up pace – likely to begin in 2012 as the rebuild of Christchurch gains pace, according to the institute Quarterly Predictions report. “The RBNZ will need to raise rates next year towards 4% to offset these inflationary pressures,” NZIER principal economist Shamubeel Eaqub said in a statement. “A high NZD is helping to keep a lid on inflation for now. We expect the NZD to remain elevated for some time,” he said. Beef + Lamb New Zealand’s (B+LNZ) Economic Service’s report on movements in sheep and beef input prices showed a 4.1% increase in the year to the end of March this year, in contrast to a 2.9% decrease the previous year. The increase has been driven by the price of fertiliser, fuel and increases in banking interest rates, says B+LNZ Economic Service Executive Director, Rob Davison. “The price rises for fertiliser and interest have a big impact given they are the largest areas of expenditure on sheep and beef farms. If the higher dollar helps keep the price of fertiliser down and keeps a rein on inflation which in turn reduces the need for interest rate rises it will compensate for the currency’s impact on export prices. Normally when the dollar is high farmers complain. There’s hardly been a whimper this time, and nor should there be. Commodity prices are still holding up and the higher dollar takes the pressure off the price of inputs like fuel, fertiliser and machinery. The Fieldays open in a couple of weeks. They’re a barometer for farming confidence and exhibitors will be expecting to make good sales.